The Másafuera Rayadito (Aphrastura masafuerae) is a small insectivorous songbird endemic to Isla Alejandro Selkirk. Due to its highly restricted range, small population size, and vulnerability to predation by non-native mammals, the status of the rayadito is of the greatest concern. Apart from the partial census by Brooke in 1986 (1) and periodic work by Hahn (mid-1990s to 2002), the species remains virtually unstudied. Brooke's estimates indicated that the total population of the species ranged between 500 and 1000 individuals. Results from Hahn's censuses suggested that the population has declined since 1986, and he estimated that there may be as few as 140 individuals remaining in the total population (2). The breeding biology of the species is virtually unknown. Only three nests have been found, all of which have been on or near the ground, making them vulnerable to predation by cats, Norway rats and house mice; all three of these introduced mammals occur in the forested habitat that the rayadito occupies. This species is in urgent need of attention in order to reassess population status, quantify threats to the species, and understand habitat requirements. Hahn, Hodum and Wainstein (2004) submitted a successful petition to BirdLife International to have the species upgraded from Endangered to Critically Endangered based on its highly restricted range, apparently declining numbers and significant possible threats. 3. install artificial nest boxes to allow us to monitor breeding population size within a subset of the population as well as breeding success, adult survival, nestling survival, etc. Jorge Tomasevic has been leading the field research efforts with excellent initial success. Results of a partial survey of one of the sectors of the island, conducted in Feb.-Mar. 2006 and using our newly developed census protocol, indicated a population of approximately 250 individuals in the sector. The surveyed area represents what we estimate to be about 25% of the possible habitat for the rayadito, thus suggesting that the population is considerably higher than the dire estimate of Hahn, but still dangerously small. During the 2006 field season, we also installed 81 artificial nest boxes. Our work is continuing in 2007, and our intention is to maintain long-term monitoring of the population, initiate detailed studies of the breeding biology and habitat use patterns of the species, and quantify impacts of non-native mammalian predators. (1) Brooke, M. 1987. ICBP Technical Report. Photo above: On IIsla Alejandro Selkirk, the habitat of the rayadito is understood to be mixed native forest and tree fern forest in the higher elevations of the island. Because of historic habitat destruction, forested habitat is restricted to elevations typically above 400 m. Some of the island's steep western valleys have intact forest at lower elevations. These areas will also be included in the study. 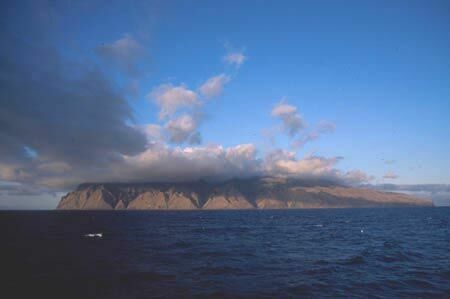 The Juan Fernández Archipelago is located in the southeastern Pacific Ocean, 670 km off the coast of central Chile. The conservation research is supported by the Corporación Nacional Forestal (CONAF) and other collaborators and funders working to understand and protect this threatened and unique ecosystem. El Archipiélago Juan Fernández está ubicado en el sureste del Océano Pacífico, 670 km de la costa central de Chile. Los estudios de conservación son apoyados por la Corporación Nacional Forestal (CONAF), un organismo del gobierno nacional de Chile, y en conjunto con otros colaboradores trabajando para conocer y proteger este amenazado y único ecosistema.